I am going to try to make this my last blog about my Yellowstone trip. I solemnly swear: no home movies. But two days ago a bunch of us from the Dakotas got a good look at a bear. The picture above is a little fuzzy: I was backing up and reaching for my bear spray when I snapped it. It is also on high magnification: I was about ten to fifteen yards away. But the bear came down onto the trail and turned in our direction, forcing us to abandon any hope of reaching Washburn summit that day. When we reported the event at the ranger station, they closed the trail. It turns out that there is a good story attached to this bear. You can see one cub in the picture. I saw at least three, which I thought was a lot, and I saw what looked like a fourth cub moving in some brush. One of our students confirmed that there were four cubs in all. The rangers filled us in. 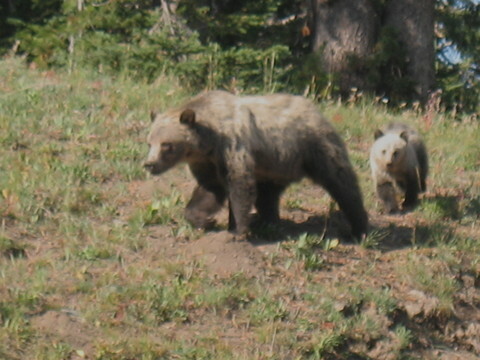 Earlier in the year, two cubs were abandoned by their mother. The momma bear in the picture above adopted them, which is to say that she nursed them. This is apparently very rare ursine behavior. I call it family values. 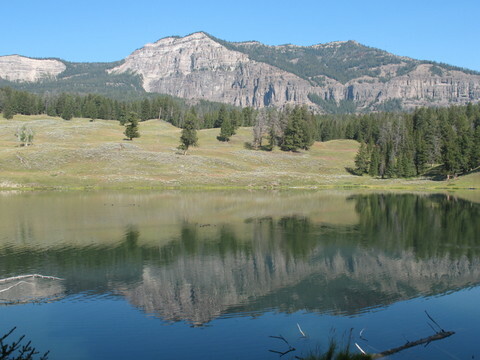 Here is a last shot of Yellowstone. The scene is Trout Lake.